Last night I had the urge to make a bunny. I don't often have such urges, but when I do, it's a good idea to go with the flow. I'm not sure why he's named Fred. In fact, I planned for him to be a girl. But it just didn't work out that way. 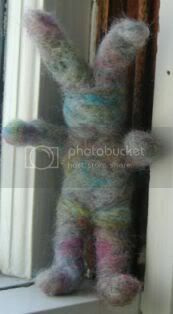 Fred is a needle felted bunny. The wool was wrapped around an armature made of pipe cleaners, so he is a bendy guy. He is about six inches tall. I think I'm going to leave the face without features, as I tend to dislike features made by needle felting, and I'm too lazy to sew or embroider. Although whiskers might be good. And I won't show you his bare backside, as he definitely needs a tail. After that? A basket. And possibly a companion. The great thing about needle felting is the immediate gratification. Fred took all of a half hour to make, whereas a half-hour's work on Clapotis is barely noticeable.